The Embsay Bolton Railway 1940s weekend took place on the 6th and 7th of September. I went along with my trusty Mamiya C330F to photograph re-enactors on a rather wet and windy day. There was just about enough light to select FP4 as my film choice for this event, which seemed to meter quite well for the outdoor areas. There were a variety of displays on the two platforms of the Embsay and Bolton railway, including one featuring US Navy personnel. A sailor smoking in the rather gloomy conditions at the Embsay Bolton 1940s weekend. The tired, questioning expression of this subject provided an interesting look to the photographs. 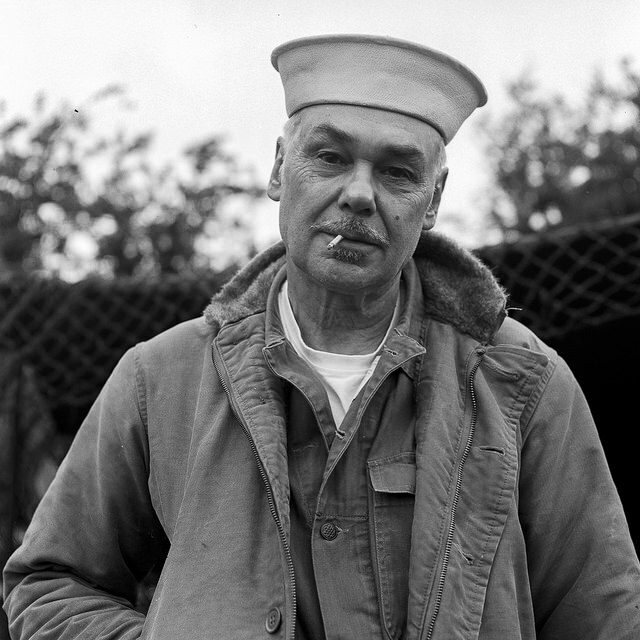 The netting in the background provides extra context, and adds to the navy feel of the image. Also taking part on the platform entertainment was singer Pete Jones, who also did a turn on the Ukulele. 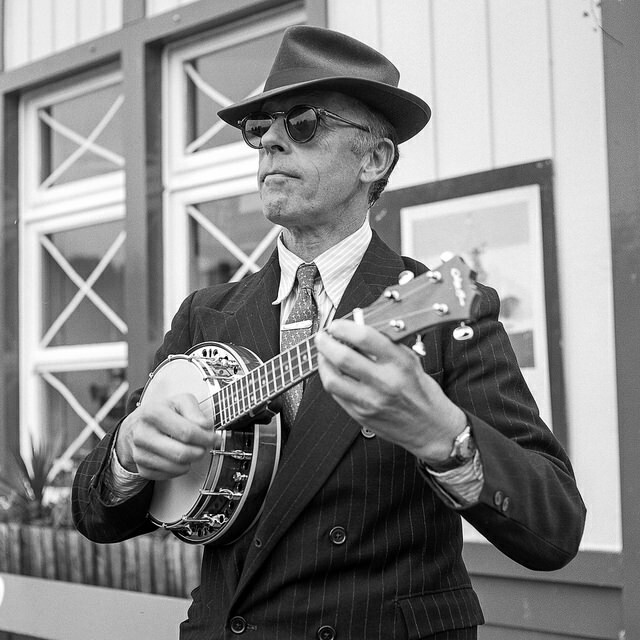 Singer and Ukulele player Pete Jones performing on the platform during the Embsay Bolton 1940s weekend. I felt the combination of the sharp suit and shades, plus the slight movement in the hand created a really authentic looking portrait of the performer. 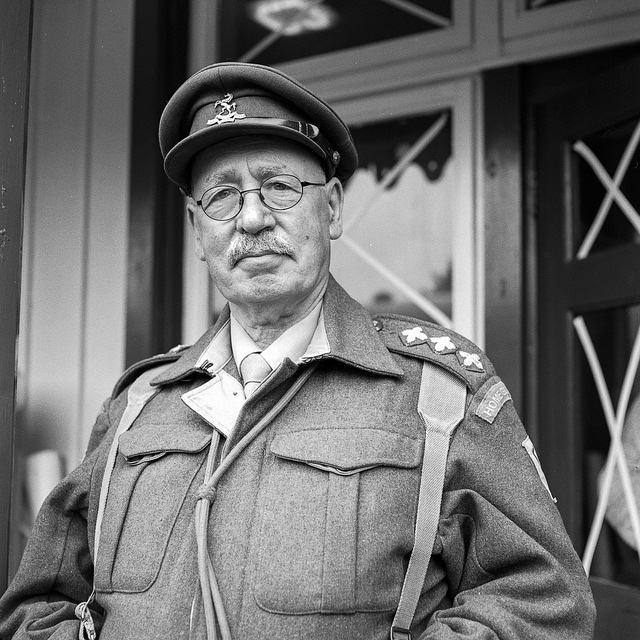 One character on the platform had a close resemblance to Mr Mainwaring from the classic TV series Dad’s Army. This was simply too good a photograph to resist, and the result had a really authentic look with the taped up windows in the background. A familiar looking home guard officer stands on the platform at the Embsay Bolton 1940s weekend. This photograph will certainly appeal to people who remember watching the TV series first, second, third or even fourth time around. 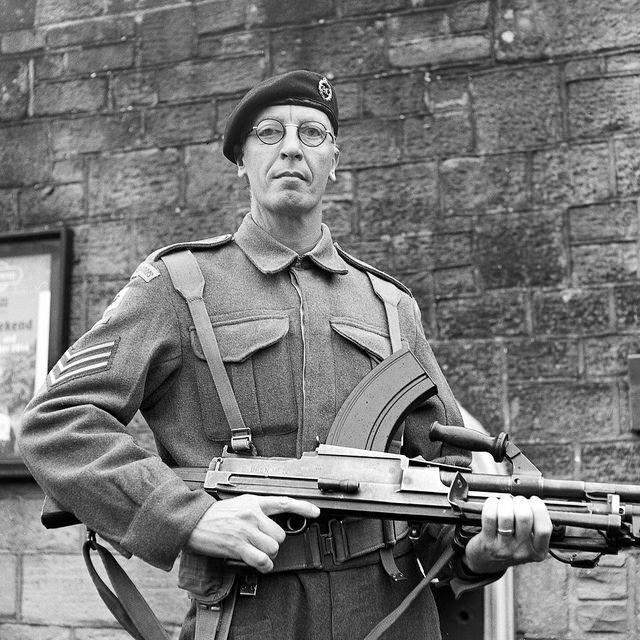 There were a number of re-renactors with accurate period weapons at the event, including the Bren gun which was used extensively by British troops as a light machine gun. A re-enactor carrying the very heavy Bren gun. I really liked the very ‘British’ look that this gent had when he was carrying his weapon on the station platform. I felt that this photograph had a very British look to it, with the smart uniform and the strong, concentrated look. I got the change to hold the Bren gun, which was substantially heavier than my Mamiya C330! Part of the event included the drill carried out by one of the officers from the home guard brigade. I decided to photograph this drill taking place, with the station provided great scenery for perspective. 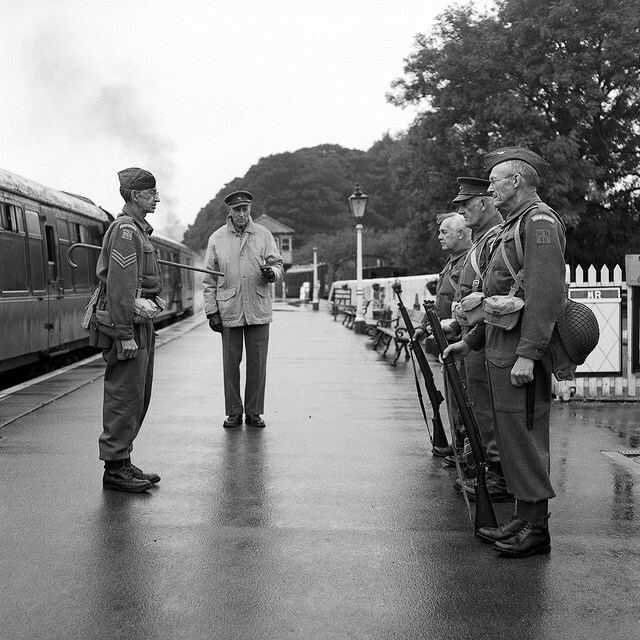 Soldiers taking part in the drill as part of the display on the railway at the 1940s weekend. I liked the way that the damp platform captured the tones of the soldiers as they took part in their exercise. The perspective also leads the eye through the picture and down to the end of the platform. I had a very enjoyable day out at the Embsay Bolton 1940s weekend, despite the slightly damp conditions. I managed to get some great photographs of re-enactors that took part in the event. I have a full set of images available on my Embasy Bolton 1940s weekend Flickr album.